Sign up and let us know you will be coming! Experience the creation of Cozad’s final tile at 5:00pm. Stay for a reception and enjoy viewing a year's-worth of spiritual artwork. FREE! All are welcome. On September 1, 2015, Cozad “Terry” Taylor began keeping a year-long, visual journal of his daily spiritual journey. To mark each of the 366 days in the leap year spanning September 1, 2015 through August 31, 2016, Cozad painted a white ceramic tile measuring 6 inches by 6 inches. 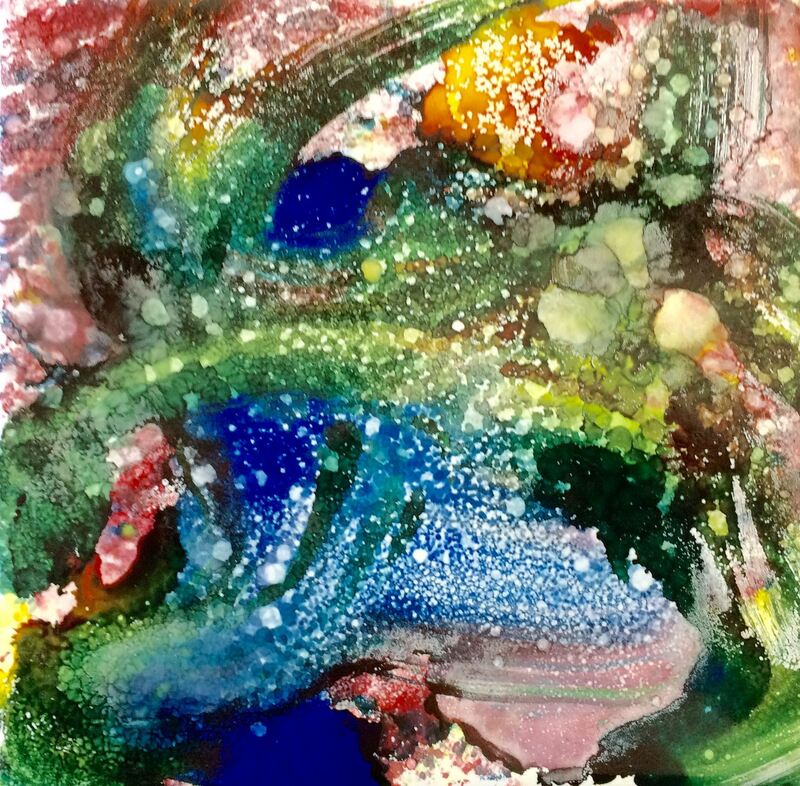 He decorated the tiles with red, blue, and yellow alcohol inks, and he manipulated the ink with a variety of tools. A photograph was taken of each of the tiles, and the resulting images posted in a public album on the Cozad Terry Taylor Facebook page. Each of the tiles will be exhibited with the date on which it was created. Choose one you like to mark a birthdate, significant memory or anniversary for a loved one or yourself! These unique and beautiful tiles are available for purchase for $10. Half of all proceeds benefit the mission of Drepung Gomang Center for Engaging Compassion. For further information, please email DrepungGomangCompassion@gmail.com or call the center at 502-614-5616. Cozad Taylor earned a Master of Fine Arts degree in 1993 from the University of Alabama. He is the retired Executive Director of Interfaith Paths to Peace.